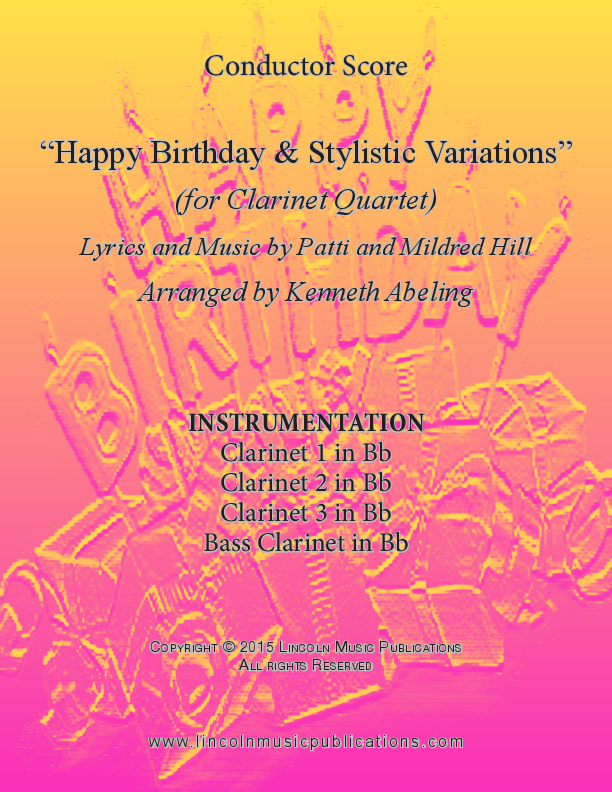 Happy Birthday and Stylistic Variations for Clarinet Quartet features the main theme in a traditional setting followed by eleven variations entitled: 1. Swing, 2. Waltz, 3. On the Range, 4. Dixieland, 5. Impressionistic, 6. Holloweenesque, 7. Majestic, 8. Jazz Waltz, 9. Bagpipes, 10. Tango and 11. Pointalistic. Suitable as a Novelty or Encore selection this arrangement offers numerous performance options as you can choose which variations to be played to fit any occasion or meet any time restraints. The Playing time is approximately 3:10 without repeats and 6:06 with repeats. The MP3 recording offered here is without repeats.